Over medium heat, in a saucepan, boil the water and 2 tablespoons sugar together.When the sugar has melted, add the coconut milk. Simmer for 10 minutes or until slightly thick. Transfer the coconut mixture to a container that can be sealed with a cover then let it reach room temperature. Put the container in the freezer overnight or until it freezes. Move around the granita with a spoon every hour. 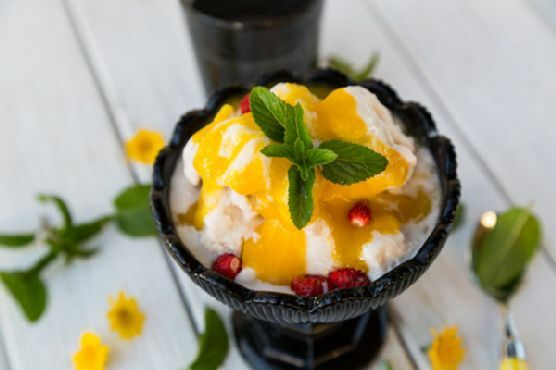 If the granita solidifies into one compact hard piece because you were not able to move it around, just break some pieces and put them in a blender to break them up right before serving.To prepare the mango sauce, put the mango pulp, 1 tablespoon sugar, lime juice, and zest in a blender and blend until smooth. Refrigerate. Serve the granita and pour the sauce on top. Granita can be paired with Cream Sherry, Moscato d'Asti, and Port. A common wine pairing rule is to make sure your wine is sweeter than your food. Delicate desserts go well with Moscato d'Asti, nutty desserts with cream sherry, and caramel or chocolate desserts pair well with port.